Patient may suffer from urinary retention as a result of disorders such as benign prostatic hypertrophy, prostate carcinoma, prostatic infarction, bladder neck contraction, prostatitis, hematoma of the urethral, edematous vulvar after vaginal delivery, stricture of the urethral, calculus at the urethral, urethritis, pelvic mass, foreign bodies, prolapse of the organs of the pelvis, tumor of the urethral, meatal stenosis of the penile. phimosis, paraphimosis, spinal cord syndrome, multiple sclerosis, spinal shock syndrome, diabetes, NSAIDS, narcotics, antispasmodic, alpha adrenergic stimulator, tricyclic antidepressant, anticholinergic and antihistamines. Patient will be admitted if present with history of malignancy, spinal cord compression ( lead to obstruction), urosepsis, or sufferer of diuresis that occur post obstruction which require pressor or IV fluids. Patient’s airway, breathing and circulation are assessed. Any abnormalities are corrected. Consider monitoring vital signs if septic shock is suspected. Bladder decompression is performed by inserting 14- 18 F foley catheter immediately. Reduced sizes to 10 F- 12F if any stricture, prior transurethral procedure and obstruction do not allow the passage of 14F - 18F foley catheter. 20- 22F catheter with acoude tip is considered in men with no history of instrumentation. Suprapubic catheter or suprapubic aspiration is considered in case of difficulty in passing foley catheter. If the patient presented with blood in the meatus, high riding prostate of rectal examination or gross hematuria consider avoiding catheterization and wait for the result of retrograde urethrogram. The bladder is drained and the urine output us monitored. Gross hematuria may occur, if the bladder is drained rapidly by the catheter. Catheterized acute urinary retention patient may suffer from post obstructive diuresis. Patient is observed for 2- 3 hours to make sure that post obstructive diuresis that may develop does not lead to hypotension. Consider in case of indwelling foley catheter the insertion of leg foley bag. Prophylactic antibiotic may not be required as the evidence of urinary tract infection is low with indwelling foley catheter. Patient with benign prostatic hypertrophy consider treatment with prazosin, tamsulosin, alfuzosin and terazosin. Patient will be followed up under the urology care. The urinary catheter may be left for 1-2 weeks in case of benign prostatic hypertrophy. Patient may be referred due to possibility of cancer/malignancy which lead to obstruction. Patient with urinary retention may complain of discomfort of the lower abdominal or suprapubic region. Patient may be distress and restless. Past medical history of radiotherapy, trauma to the pelvis, prostate cancer or urinary retention are best asked. Drugs or any medication intake should be pin point. Patient is asked regarding any neurological symptoms such as weakness, loss of sensation or numbness. Any evidence of urinary tract infection, pyelonephritis or calculus should be acquired. Rectal examination, abdominal examination, neurological examination and gynecology ( female ) examination are performed. 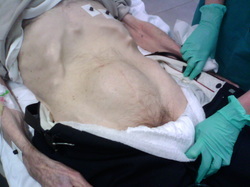 The investigations required are full blood count, urea and electrolytes ( renal insufficiency), imaging technique ( MRI spine, CT scan of the pelvis, US scan of the pelvis) and measurement of postvoidal residual. If it is more than 200 ml it is abnormal. Urinary retention include acute urinary retention and chronic urinary retention. Acute urinary retention is inability to void spontaneously. It affect male 60 years old and associate with benign prostatic hyperplasia. Pathologically urinary retention is associated with neurogenic bladder, automatic bladder and atonic bladder. Neurogenic bladder is associated with partial damage to the brainstem or spinal cored which interrupts inhibition. Automatic bladder is due to the damage of the spinal cord above the level of S2- S3, This will lead to loss of facilitatory impulses from the cerebrum and brainstem which lead to spinal shock which inhibited micturition. The excitability of the micturition reflex will be return by intermittent straight catheterization. Atonic bladder occur due to destruction of the sensory nerve fibers from the bladder to spinal cord which preventing the transmission of signal that prevent the micturition contraction reflex. It occurs due to years of infrequent voiding and mostly affecting female. Overflow incontinence may occur due to bladder fills at capacity with overflow a few drop at times. 1.R, Pickard, Emberton M, and Neal De. “The Management of Men with Acute Urinary Retention. National Prostatectomy Audit Steering Group.” British Journal of Urology 81, no. 5 (May 1998): 712–720. 2.Jacobsen, Steven J., Debra J. Jacobson, Cynthia J. Girman, Rosebud O. Roberts, Thomas Rhodes, Harry A. Guess, and Michael M. Lieber. “Natural History of Prostatism: Risk Factors for Acute Urinary Retention.” The Journal of Urology 158, no. 2 (August 1997): 481–487. doi:10.1016/S0022-5347(01)64508-7. 3.Birkhoff, John D., A. Roger Wiederhorn, Mary L. Hamilton, and Hans H. Zinsser. “Natural History of Benign Prostatic Hypertrophy and Acute Urinary Retention.” Urology 7, no. 1 (January 1976): 48–52. doi:10.1016/0090-4295(76)90560-4.